“Entrepreneurs are the engine for economic growth and jobs creation,” Chris Shipley, the founder of the GuideWire Group, reports. 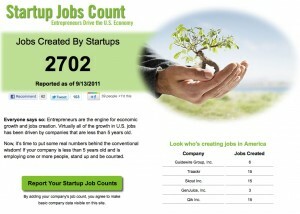 “Now, it’s time to put some real numbers behind the conventional wisdom!” As a result she has created Startup Jobs Count. Entrepreneurs! Speak up! It takes ages to get data from official reports. So getting back to the source of jobs creation, the entrepreneurs themselves, is Chris’s methodology. This is a crowdsourcing approach of sorts that is empowering entrepreneurs to speak up and brag about their ability to create jobs. Spread the word: Last week, Chris broadcast her initiative via various social media channels, inviting entrepreneurs of any company in the US that is less than 5 years old and employs one or more people to stand up and be counted. The success of the initiative is predicated on people’s initiative to become known. So spread the message as much as you can! Spread the word to startups of all kinds: We are in Silicon Valley, and we obsess with high tech. Make sure that you encourage all your friends, regardless of the company they are starting, to report their startup jobs counts.